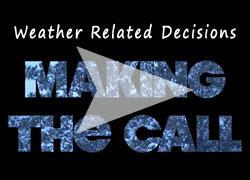 How are Weather-Related Decisions Made? When inclement weather occurs, AACPS has personnel out assessing the roads as soon as that is practical. Decisions about delayed openings or closings are made with many factors in mind, most notably the condition of school lots and walkways, the condition of roads, and the condition of sidewalks students must travel to get to school. Employees may call the following telephone numbers for announcements regarding school and/or central office closings due to inclement weather.